Ultra powerful zoom function with enlargement by up to 1000%. With 18 zoom settings, Photo Maximizer portable can tell you the target size of the image in pixels or centimetres. The required resolution can also be adjusted to give you flawless results. This is particularly important when printing your photos and guarantees you the highest quality results. – Three stages are all it takes – upload, select subject & zoom! InPixio Photo Maximizer has been designed to be user-friendly and even includes a helpful wizard. – Select the zoom setting: and that’s it! Usually when you enlarge an image you get pixilation and deterioration of colour and brightness. Photo Maximizer maintains image quality and undesirable noise. With InPixio Photo Maximizer say goodbye to pixelated, grainy and blurred photos when zooming in. 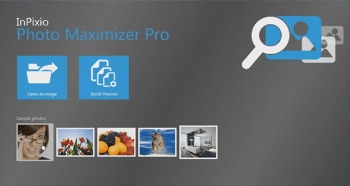 Define your zoom settings and Photo Maximizer will batch process up to 1000 images simultaneously! – Enlarge extracts from your photos with no loss of quality! – Enlarging photos without Photo Maximizer often results in pixelated images. – Create poster size prints! – Enlarge up to 1000%!